China Tri(2,3-dichloropropyl) phosphate Suppliers, China Tri(2,3-dichloropropyl) phosphate Manufacturers. 1,Staff mission: to develop, innovation, cooperation and good faith. 2,Company's goals: a hundred years the name Enterprise, the industry fresh air. 3,Staff objectives: Choi-chi, with a minor, win-win progress. 4,Business philosophy: science and technology, quality, service, win-win situation. 5,Service spirit: Dissemination of cutting-edge technology together to create wealth. 6,Staff spirit: innovation, cooperation, sincerity and dedication. 7,Development strategy: the internationalization of enterprises to enter the brand name. 8,The core concept: the market conception of qualified personnel, learning concept. Products are being exported to South Korea, the United States and Germany, and in full compliance with international standards for the import and export. It is colorless transparent oily liquid , Specific gravity(20°C)1.504, Conversion raten n20D1.498, Flash point(open)251°C, Freeze point-6°C, Decompose temperature 230°C, solubility 0.01%(30°C), P 7.2%, Cl 49.4% ;soluble in ethanol and chloroform, insoluble in aliphatic hydrocarbon. It has good performance for fire retarding and plasticity. It can be used as fire retardant for PVC, soft or hard foam polyurethane, epoxy resin, unsaturated resin, polyester fiber & rubber conveyer belt. 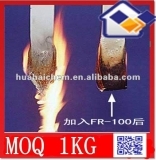 Besides self-extinguishing character, it can impove other performances of product, such as water proof, element resistance, antistatic performance, soft feeling, dosage is 15-10% for soft or hard foam polyurethane, 10% in pvc, self extinguishing in 1 seconds, 5% for polyester fiber.Compared with other similar products, our product feautures low chroma, low acidity and low viscosity. Storage & packing : In galvanized metal pail , Net Wt. 250kg .